It's officially October and summer is behind us. Now commences the annual finger-crossing and hoping that at some point throughout the next few months your favorite music act hits Miami so you don't have to wait out the long winter till WMC or Ultra to catch them. 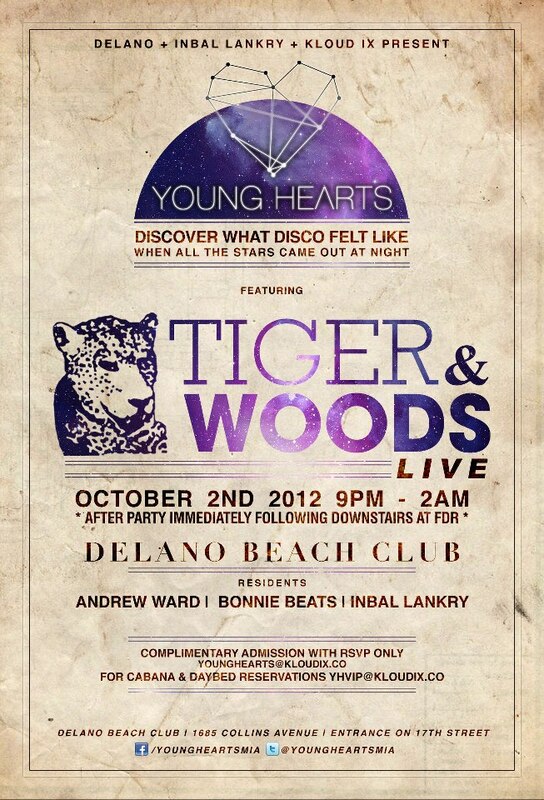 Starting tomorrow the chances just got a lot better with the launch of Young Hearts, the new monthly Tuesday party at the Delano Hotel. Together with over 25 years of experience in music, Inbal Lankry and Kloud IX Entertainment bring you a party comprised of innovative underground music selection, and a southeastern breeze that creates the weightless vibe currently missing from your week. An intimate poolside Nu-disco retreat, Young Hearts is something that is nowhere to be found in Miami. Take the plunge into the pool or stay dry, either way your sure to groove effortlessly into Wednesday. First up tomorrow (Tues Oct. 2nd) is production duo, Tiger & Woods. Not much is known about them and they seem to like it that way. However their sound speaks volumes, answering all possible questions you might have about dancing on a Tuesday, or in the pool. Check out some of Tiger & Wood's original productions below, as well as a remix of a Tensnake track they did and their recent set at Movement Festival in Detroit (free download). If by chance the weather turns typical Miami, the party will be relocated to the Delano's FDR. See everyone tomorrow!